Cassini turns its gaze toward Saturn's outer A ring to find the moon Pan coasting behind one of the thin ringlets with which it shares the Encke Gap. Pan is 26 kilometers (16 miles) across. Understanding the influence of Saturn's moons on its immense ring system is one of the goals of the Cassini mission. 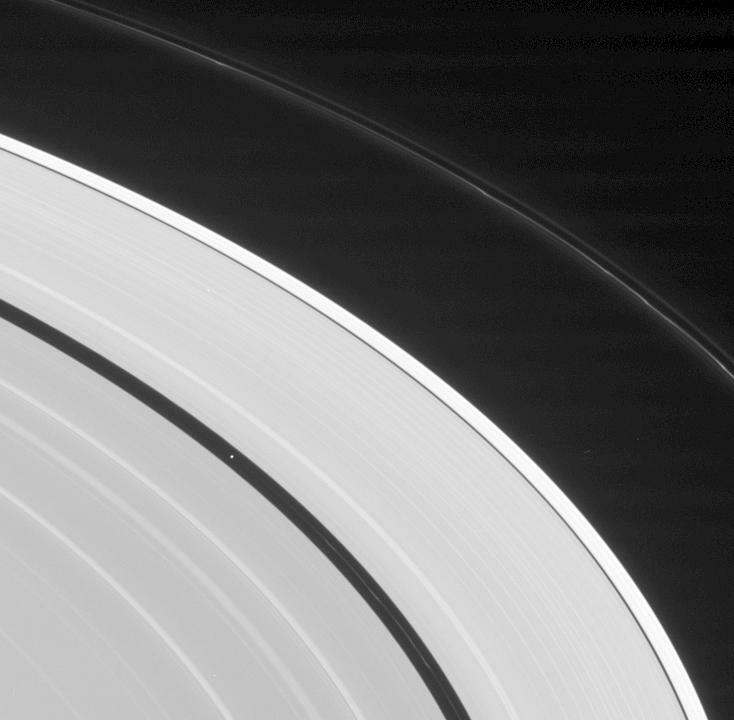 The study of the icy rings includes the delicate and smokey-looking F ring, seen here toward upper right. The F ring exhibits visibly bright kinks and multiple strands here. Arching across the center of the scene, the outermost section of the A ring is notably brighter than the ring material interior to it. The image was taken in visible light with the Cassini spacecraft narrow-angle camera on Aug. 13, 2005, at a distance of approximately 2.3 million kilometers (1.5 million miles) from Saturn. The image scale is 14 kilometers (9 miles) per pixel on Pan.